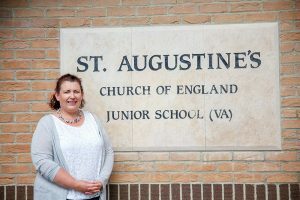 Welcome to St. Augustine’s CE (VA) Junior School. Here at St. Augustine’s CE (VA) Junior School, we put children’s enjoyment and achievement at the centre of everything we do. We work hard to provide a creative and engaging school curriculum, and I hope you will see from our website that there is always plenty going on, and much to celebrate! The values and aims of our school are built firmly on Christian beliefs and principles, embodied not only in our heritage as a Church School but also in our everyday interactions and activities. It is through the support we give to each other that we build up respect, friendship and effective teamwork. I feel very proud to be able to lead and serve this school community. I hope you find the information on our website useful and interesting. If you are a prospective parent please come and visit us in person; we’d love to show you around our fantastic school and introduce you to our pupils of whom we are very proud.